A new Pokemon game starring the yellow mascot is reportedly in the works for the 3DS. While the world is busy wrapped up in the Pokemon fever surrounding the launch of X and Y, Japanese TV station NHK will offer a sneak peak into a different kind of Pokemon game in an upcoming program. We've heard very little about this game, except that it will star Pikachu and be available on the 3DS, and while the preview trailer for the NHK program did offer a few "in development" screenshots, it was still quite scarce on details. 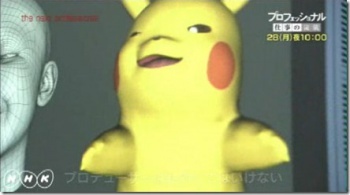 One of the screenshots, which you can see above, shows a somewhat terrifying Pikachu forced to contort his face to mimic human facial gestures. Another shows someone using a magnifying glass to examine the yellow rat. The upcoming program, called "Professional-Style of Work" will examine the success of the Pokemon franchise, as well as take a longer peak at the "top secret" Pikachu game's development process. The game is said to use "playfulness" as a weapon to take on the world. Pokemon producer and CEO of the Pokemon Company Tsunekazu Ishihara will be making an appearance in the full episode of the special program, which will be airing on October 28, so you'll have to wait until then to see exactly what this game will be all about. What do you think this game will be all about? From the looks of things, it's possibly some kind of Tamagotchi-style virtual pet, though i'm not sure how that would fill up a full-priced 3DS game.